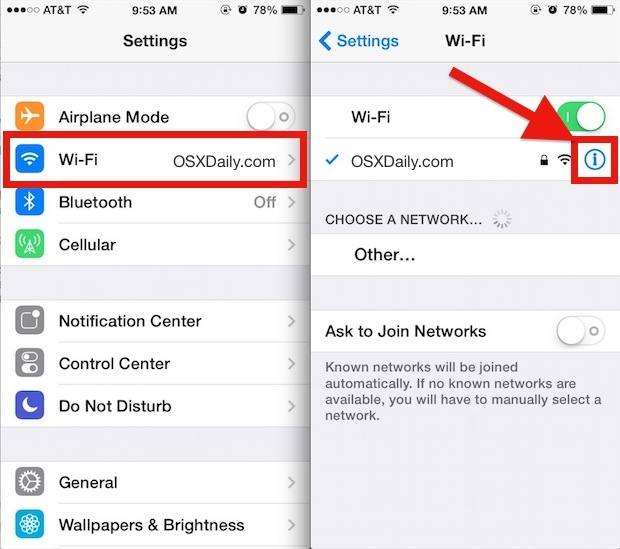 When you point your iPhone or iPad at a web address (like osxdaily.com), iOS will perform a DNS lookup to send you to the proper location. DNS servers handle part of that lookup service, translating numerical IP addresses into the readable domain names we’re all more familiar with and associate with web sites and other internet addresses. Most internet service providers provide their own DNS servers, but let’s be honest, they’re not always the fastest, thus you can sometimes speed up your internet service or even resolve some networking issues by changing DNS settings to another set of servers. Changing the DNS settings in iOS are what we’re going to cover here, and the process is the same on any iPhone, iPad, or iPod touch. Note that you must be connected to a wi-fi network in order to set a new DNS server or change the DNS settings in general. Without a wireless connection, there is either no DNS to change (in the case for a wi-fi only device), or, in the case of an iPhone, DNS is set by the cellular network provider and is unable to be customized until a wi-fi network has been joined. 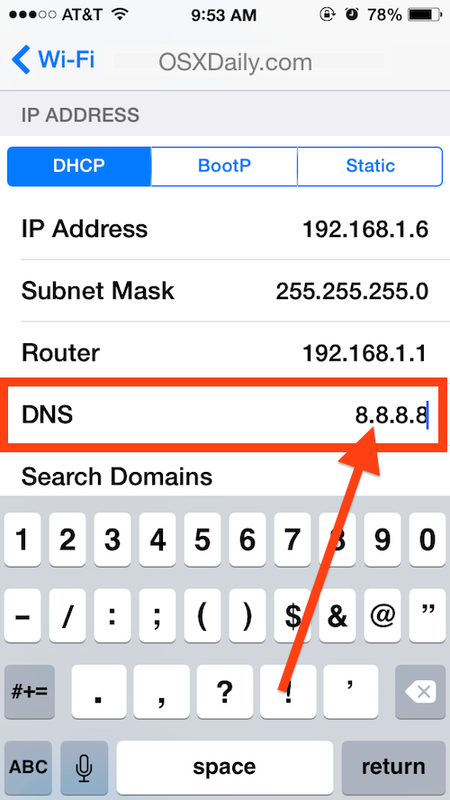 Setting DNS is the same in all versions of iOS and on all devices, though the general appearance will look a bit different from modern versions of iOS compared to older versions. 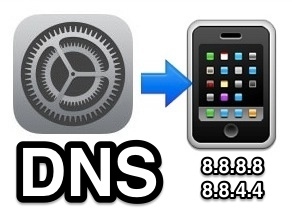 You’ll likely want to reboot the iPhone, iPad, or iPod touch in order for the DNS change to take effect, otherwise the old DNS servers may be cached in iOS. You can either do a hardware reboot by holding on the Power button to turn the device off and on again, or use one of the iOS Settings based software reboot methods if the physical buttons aren’t working or are inaccessible. Wi-Fi routers almost always dispense a DNS server automatically through DHCP, typically matching the routers IP address, and then they pull the DNS specifics from the ISP. This means you’ll often see something like “192.168.0.1” as the DNS setting when you first check it. If you aren’t experiencing any particular issues with your default settings, there is little reason to change them, unless you anticipate a performance boost by switching DNS to a faster service – more on that in a minute. If you’re going to set a custom DNS, it’s generally a good idea to perform a DNS performance test with an app like NameBench to determine which is the fastest from your network and location, this requires using a Mac or Windows PC, but it is worthwhile and can result in better internet experiences and improved performance. Technology left me at the bottom of the proverbial curve decades ago. Your article looked as though it would be interesting and even useful if I had an inkling whether, why, and when I would need to know this. I guess if I don’t understand it I don’t need to know. Thanks for many of your other postings though. Namebench is way out of date and incorrectly reports domains as hijacked causing unnecessary concerns and wasted time. I used to use Open DNS. I did not find it any faster and stopped using it because of some issues. I forget what those were, but when I switched to my internet provider’s DNS servers things worked much better. If you’re using public WiFi — i.e., any WiFi access point other than your own: You shouldn’t be…unless you’re using a VPN to protect yourself. Some WiFi providers, like The Cloud in the UK, won’t work if you mess with the DNS. I had the OpenDNS servers set into my laptop network settings, but it wouldn’t work in the coffee shop I was in. The problem was that the redirect that the login script used would fail unless you were using the router supplied DNS. As OSX, and I’m guessing iOS as well, prefer defined DNS to inherited, having explicit entries can cause problems. Got a new iPad mini and I can’t get new DNS to stick at all. Keeps reverting back to original. The app has a built in list of popular DNS servers you can choose from. You can also create your own profiles and quickly switch depending on your needs.